Generally speaking, it's what's inside a bottle that counts. It could come out of a yak udder just as long as it still tastes like a fine, single-malt Scotch. Still, there's nothing wrong with a little creative packaging. 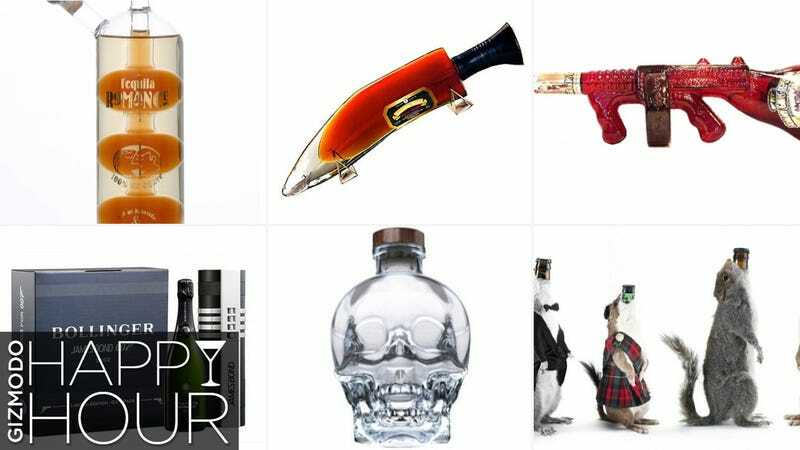 And booze bottles come in some of the most creative, decadent, and just plain bizarre designs you can imagine. It's Friday afternoon, you've made it through the long week, and it's time for Happy Hour, Gizmodo's weekly booze column. A cocktail shaker full of innovation, science, and alcohol. How do you bottle uncomfortable? Not only does Milagro make a very tasty tequila, but if you go for one in their "Select" series, you'll be treated to a 750ml bottle with an agave plant hand-blown right into the glass. Gorgeous. Best of all, this one isn't even hard to find. They range between $45 and $100 at BevMo. Truth be told, this list is just barely scratching the surface of the weirdness that's out there. Within the category of Armenian Brandy alone there's a ton of strange stuff, or peep some of these imports. We could have gone on for days, but frankly, we'd rather see what you can find out there in this big, weird world. Drop a pic in the discussion below and let's see if we can't make this page the best compendium of strange liquor bottles out there.